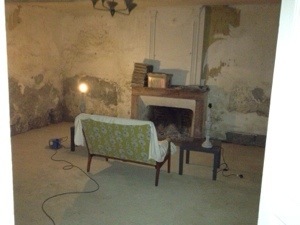 When we first bought the ‘house in france’ one of it’s biggest selling points was the sheer size and scale of the rooms. Majestic one could say. Certainly compared to London living where if you can afford a three story shoebox with a postage stamp sized garden its considered living in Versailles! 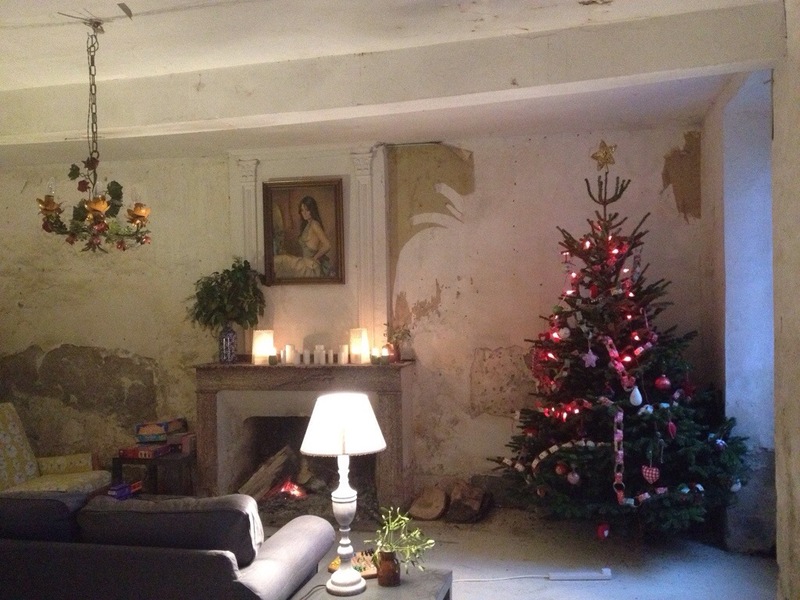 And the french house had rooms the size of entire floors of our London home. And so it was with the ‘Salon’. Too grand to be called a ‘sitting room’ and the word ‘lounge’ brings me out in funny lumps n bumps and certainly not a ‘drawing room’ as we had no intention of withdrawing to it – in fact we intended to spend hours of our time there so we plumped for the french – ‘salon’ when referring to it. Initially the salon didn’t have a floor. It had rats running through it eating up the broken floorboards and so we closed the doors and avoided it at all costs. But once we’d had some people come in and concrete the floors (sorry Ratty – maybe they’re still there like Han Solo – frozen in time or people in Pompeii having their tea when the volcano hit) we started to use the biggest room in the house. And for Christmas each year we built big fires and had the tree and a couple of sofas thrown in to sit on. The mid century modern sofa eventually ended up in the kids sitting room (see blog post here) but the big squishy grey sofa will remain. It came from IKEA and is a bargainous EKTORP – the cheapest one they do. But as it’s already had children peeing on it and paint splattered over it as part of project redecorate I think it was a wise move not to go for Parker Knoll! It is essentially the last room we need to decorate and in some ways I’m worried about where my blog will go once I’ve shown you this!!! Although we still have sub rooms and hallways and barns and exteriors to make over. So don’t abandon me just yet. And it was VERY pink. And we used two whole tins of relatively expensive paint. 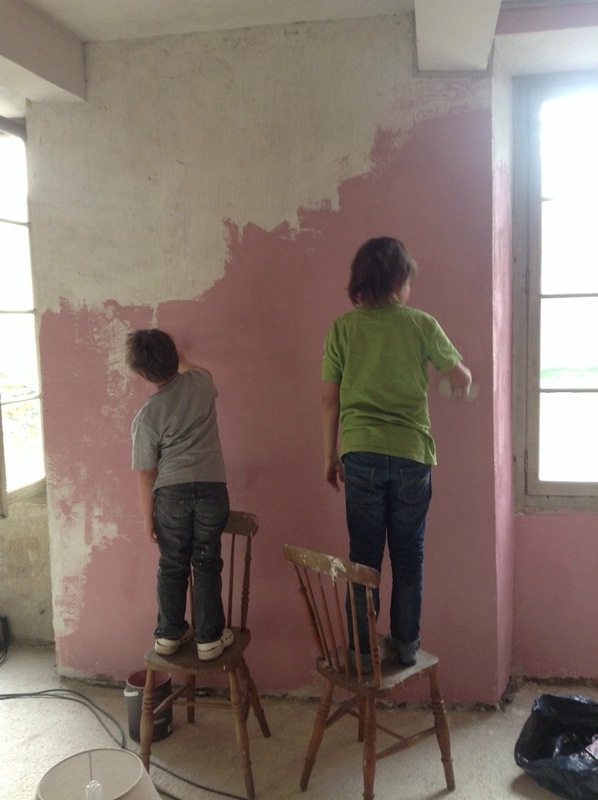 This entry was posted in Uncategorized and tagged concrete floors, earthbourne paints, French property, maubourguet, pink paint, renovation, room makeover by vicawhite. Bookmark the permalink. Have to say was loving the Kings Speech wall… Any chance of getting it back? How about grey? Then, you can accessorize with orange, or red, or even pink. Go a shade darker or lighter than your Ikea sofa, pile it with pillows and big, bold (contemporary) artwork to contrast the formal aspect of the room. I was so relieved to get to the end of the post and found out you hated that pink – was gonna have to fall right out with your sense of style!! 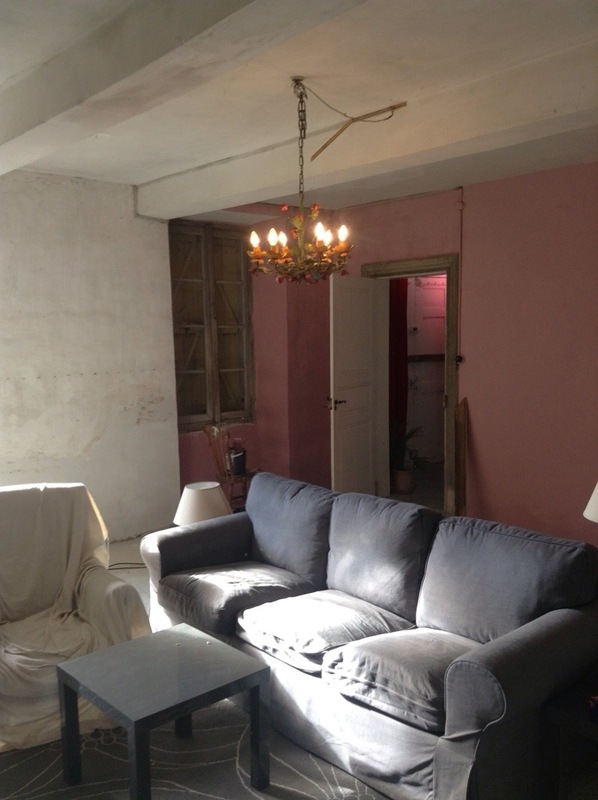 The right pink however could look fabulous – looking forward to knowing if you find it…..
Oh, and – I am so glad someone else can’t use the word ‘lounge’. yes, how about super chic pavilion grey with cream shutters? I’ve done that in my kitchen and it looks FAB. Get some wood in the mix to warm things up. Love the pavillion grey with pink. Check out the F&B website for photos of grey dining room with pink upholstered chairs. Checked it out. I do red against the grey but the pink is also v good – v. Feminine….. 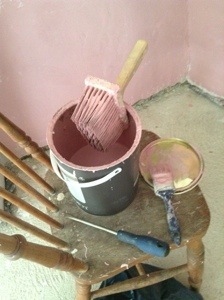 Doing mine in adobe pink 5 by Dulux as it looked really good in Homes and Gardens. Not at all subtle though. I got bored of mature colour schemes. Suze, what will you use as accessory colors with the adobe pink–turquoise? I’d like to see photos. I have two homes. Both livingrooms/salons are different shades or variations of khaki/tan/paper bag color with white trim. My soft furniture is orangish in both cases. Kilim rugs with orange in them in one. While the rooms are very different from each other, the khaki walls seem to work for us in both cases. In other rooms I’ve paired it with oatmeal white furniture and a riot of colorful pillows, which works. I like the neutral pallet with bold colors in the pillows, throws, and soft furniture. In one house, it’s open plan, so I’ve done a grey and white lattice area rug in the dining area, which is away from the orange bits, but still visible. There I’m bringing color in the artwork and table linens. It’s tricky when the rooms are open to each other and limiting as well. There’s always a challenge in decorating. Anyway, I love the pink ideas. Looking forward to seeing photos.